Hello everyone! It's time for another Book Nook! This week, we will be taking a peek at Skirt-A-Day Sewing by Nicole Smith from Storey Publishing. I have a terrible weakness for boots, and am always looking for a great skirt to go with them, so I was very excited about reviewing this book! The author, Nicole Smith, is one busy lady. She teaches sewing workshops and classes in New York, designs clothing, jewelry, accessories and sewing patterns, and is part of the Etsy marketing and merchandising team. She has written for various fashion and sewing publications, and is a regular contributor to Stitch magazine, so she definitely knows what her subject matter! Visit Nicole's website at www.styleschematic.com to learn more about her and check out her blog. Now, let's talk about the book! The first three chapters are all about getting prepared - Chapter 1 goes over your basic sewing, pressing and patternmaking tool kits, Chapter 2 goes over construction how-to's like materials, ironing, interfacing, types of seams, etc., and Chapter 3 is all about drafting your own custom patterns. For me, Chapter 3 is the foundation that the rest of the book is built upon. It gives you an easy to follow method for drafting your own custom-fit skirt pattern. Once you master this, you can easily tackle the skirts featured in the following chapters. 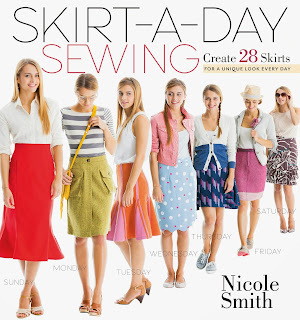 The rest of the book is devoted to showing the reader how to make four basic skirts - wrap skirts, straight skirts, flared skirts, and high-waisted skirts. There are seven variations for each style, which gives you a total of 28 different skirts to create! The book doesn't have a spiral binding, but the pages are printed on nice heavy paper, so it stay fairly flat when it's opened. There are a lot of illustrations, which make the instructions much easier to follow. Overall, we give this book a "two thimbles up"! Thanks to Storey Publishing, we have a copy of this book give away! Leave a comment here telling us why you'd like to win it. Make sure the comment also includes your first name, last name, city and state so we can find you. Be sure to like us on Facebook as well, and fill out our contest registration form - the link is located on our Facebook page. Deadline for comments is Thursday, Nov. 7th, 2013 at 5 pm Eastern time. Good luck! Congratulations Maree! We hope you and your granddaughter will enjoy it! Summer is over, so it's time to snuggle up with a good book and get some projects done! 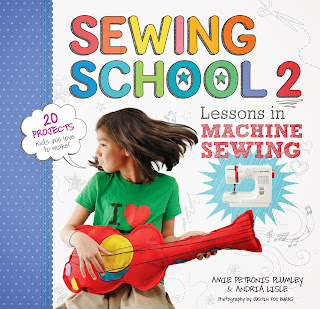 This week we're reviewing Sewing School 2 by Amie Petronis Plumley and Andria Lisle. If you have kids or grandkids that are interested in learning to sew, then this is the book for you! 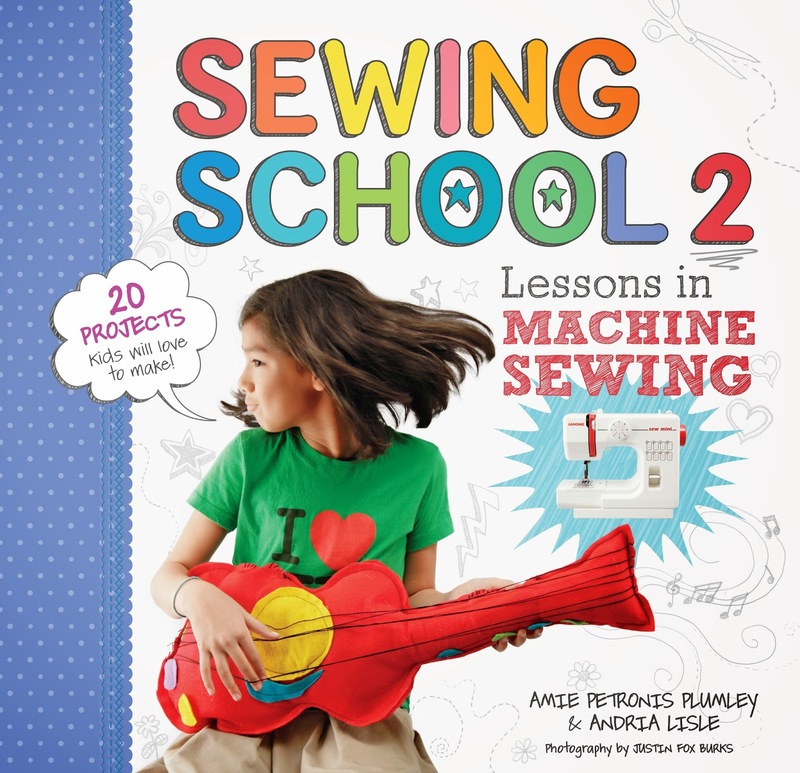 The book is intended to help kids master sewing with a machine, and they can easy follow along with the instructions and step-by-step photos. The authors, Amie and Andria, teach a Sewing School day Camp each summer, and had the kids test all of these projects. If you'd like to find out more about the authors, visit the Sewing School blog at http://sewingschool.blogspot.com/. The book starts off with an introduction for the adults, then a welcome for the kids. 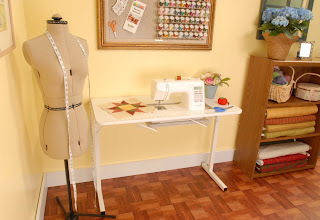 Following that, there are twelve lessons for the kids that will teach them how to use the book, how to choose a machine, what you should have in your sewing kit, etc. Lesson Thirteen is a "pop quiz" of three simple projects that will test what the kids learned from the first twelve lessons. After that, it's time for the projects! There are 20 projects in all, and they are divided into four different categories - In My Room, Let's Go, Time To Play, and The Great Outdoors. The projects are rated by difficulty. We especially love the stuffed guitar in the Time To Play section! The book itself has a covered spiral binding, which means it lays flat when it opens - very handy when you're trying to follow along on a project. It also has patterns inside the back cover for all the projects that need one. Overall, we give this book a "two thimbles up"! Thanks to Storey Publishing, we have a copy of this book give away! Leave a comment here telling us why you'd like to win it. Make sure the comment also includes your first name, last name, city and state so we can find you. Be sure to like us on Facebook as well, and fill out our contest registration form - the link is located on our Facebook page. Deadline for comments is Thursday, Oct 24th, 2013 at 5 pm Eastern time. Good luck! Another Gidget Winner, and Shirley Is On Deck! Wow, we have given away so many Gidgets this year, we can't believe it's time to announce another winner! Thanks so much to all of you that join us on Facebook and make these giveaways possible. 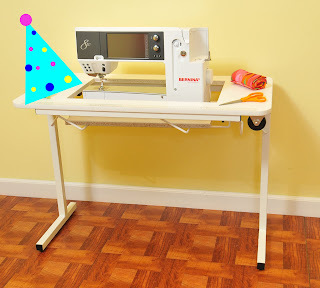 Don't forget - we're giving away one of our adorable Shirley cabinets when we hit 15,000 likes - that's not too far away! Now, without further ado, our winner is Susan Bennett from Rogers City, MI! Congrats Susan, we'll be emailing you shortly! Lookout 15,000 - here we come! Gidget Giveaway - Make Sure You're Registered! Hello Everyone! We went over 14,500 "likes" on Facebook this week. so that means it's time for a Gidget Giveaway! Since we have so many new friends, we want to make sure that everyone understands how the giveaways work. In order to be included in the random drawings for our weekly swag giveaways and the giveaways we do when we gain "likes" on Facebook, you must be registered. However, you only have to register ONCE. If you have registered with us since our big "Sewing Suite Giveaway" when we hit 10,000 likes in April, you don't have to register again. If you haven't registered with us, you will need to sign up by clicking on the purple "Sign Up for Our Giveaways" block located under our timeline photo on our Facebook page. If you're only able to check-in on a mobile device, visit this link instead: http://on.fb.me/XzJzcV This will also give you a chance to update your contact info so that we can reach you when you're a winner. If you can't remember if you've registered or not, just try to enter your info. If you have already registered you'll get the following message: "An entry with this Address/Email has already been recorded". That means you're all set! Please note - do not try to register with multiple emails. As we have done in the past, duplicate entries will be deleted. Our giveaways are open to residents of the United States and Canada. * We'll be drawing a name this Friday, 10/4/13, so make sure you're signed up! Registration closes at 5 pm Eastern on 10/4/13. Good luck everyone!